British news coverage of North Korea suffers for two primary reasons: an insular attitude toward the outside world and the British public’s relative lack of interest in Korean affairs. The result is a trivia-dominated approach that emphasizes the weirdest stories over substantive issues. This state of affairs seems unlikely to change as British media are addicted to this style. Falling customer numbers and revenues mean that there is less money available to provide more informed coverage. The rest of the world is of little interest compared with the success of British sports or the antics of celebrities. Korea, little known in Britain except to those with a direct interest, is unlikely to displace such stories. The current media age is remarkable. Probably never before has so much news and information flashed around the world, reaching vast audiences. Where once speedy knowledge and analysis of the news was confined to a privileged few, now it is available for all. However, while modern communications produce masses of information and analysis, much of what is presented as news is gossip or trivia, lacking substance and importance. Tabloids and some websites may be the worst but they are not the only offenders. 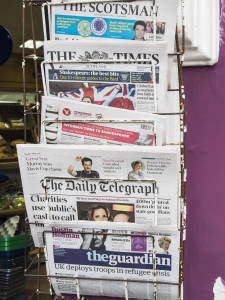 In Britain, even major news outlets such as the BBC, The Guardian, The Times and the Daily Telegraph will present news in bite-sized pieces that, as often as not, take a mocking or jokey tone. The tabloids, for their part, report on most of what passes for foreign news in a flippant tone, with xenophobia never far from the surface. This happens even when a story, such as the recent defection of the London–based North Korean diplomat, Thae Yong Ho, appears to have possible serious repercussions. Thae’s alleged addiction to golf and his wife’s to shopping played as large a role in the reporting as did any political significance of the move. The main emphasis in British coverage of North Korea is on the odd and the peculiar. For instance, haircuts are a perennial favorite subject: Kim Jong Un’s hair is regularly mocked, even though the style seems to be common all over northern Europe. The supposed compulsory styles forced on young men is frequent feature, even if there is plenty of evidence that many different styles can be seen throughout the country. Even Thae’s defection was linked to the haircut story. In 2012, British media reported on the finding of a “unicorn lair” in North Korea, with The Guardian and the Daily Telegraph framing the story not as a myth but as an indication that North Koreans really believed in unicorns. In July this year, the Daily Mail reported that Kim Jong Un was devastated by international sanctions on luxury goods because of his love of Swiss cheese and watches. We also have had giant rabbits, catfish and a regular diet of weird leaders doing odd things—all are jumbled together whether true or not. Other examples include The Times reporting that two officials were executed with anti-aircraft guns for falling asleep during a meeting, while the Daily Mail said construction workers were forced to take crystal meth to meet construction deadlines. On August 5, the Daily Star ran the story, “Vladimir Putin is set to send his fist crashing down on Kim Jong-un,” even though the story was, in fact, reporting on South Korean President Park Geun-hye’s planned visit to Moscow. A similar case was a story by the Daily Express about North Korea extending conscription to its female population, citing in the article that 22 million North Koreans died after a famine and food crisis (the population of North Korea is around 25 million). Why bother checking? They are foreign and a long way off. It was not always so. I first learned about Korea at the age of seven or eight via the BBC, which, at the time, was Britain’s only radio broadcaster. Later, I learned about British politics from the Daily Mirror, which was known for its sharp staccato style, cartoons and light reporting, but it had a more serious and international side as well. At school, with a 30 minute train journey morning and evening, I switched to the Telegraph. I ignored the politics; it was the solid reporting that grabbed my attention. In my university years, liberal political views got the better of me, and The Guardian—by then, based in London—became and remains my newspaper of choice. For all of these, the most there was by way of entertainment rather than reporting or editorial comment was a crossword puzzle or a chess problem. Well-founded radio and television news supplemented newspaper reading. By 1961, changes were underway. Postwar austerity was long gone. Newspapers had plenty of advertising and plenty of newsprint. There was money for foreign correspondents. Competition from television—the BBC had lost its monopoly in 1955—meant that newspapers were expected not only to provide more in-depth reporting, but also to be more entertaining. Color supplements appeared—a far cry from that spin-off from The Times, The Times Literary Supplement—and reporting became less formal. All papers began to devote more space to lighter pieces and the distinctions once maintained in the “quality papers” between news and commentary became blurred. In the 1990s, as times became harder and the competition from new media increased, the trivialization of news became more pronounced. Cute pictures and amusing stories were what were wanted. Foreign news, often complex and difficult, was steadily reduced, while rising costs meant cutting back on overseas correspondents. Eventually, the doings of film stars became more newsworthy than the coverage of wars and tensions far away. Then there was the British attitude to foreigners. Britain may have once had a vast empire and the British may holiday abroad, but the recent referendum campaign over Britain’s membership in the European Union showed the depths of suspicion and apparent dislike in the media of our nearest neighbors. (One who contributed greatly to this approach when he was The Times’ correspondent in Brussels was Boris Johnson, the present British Foreign Secretary. The paper eventually sacked him for making up stories.) This attitude is worse the farther away one goes. British news coverage of Korea is shaped by the fact that the peninsula was never historically of great political or economic importance to Britain; China and Japan were far more important. (Winston Churchill is reported to have exclaimed at one point: “Korea? I never heard of the bloody place until I was 70!”) Occasionally, there was brief interest in Korea, usually for imperial reasons, but it never lasted long. For instance, Britain had diplomatic and consular relations with Korea from 1883 to 1941, and the first consul-general, W.G. Aston, became an established scholar of the language. But after Aston left in 1885, only one other British official took the trouble to qualify in Korean until the late 1950s. British trade with Korea, after some initial interest, was negligible. Its missionary role in the country did not compare to the US presence. British activity was concentrated in and around Seoul; the north of the country was almost unknown territory. Few books about Korea appeared in Britain, and newspaper coverage was rare. Moreover, no British university taught Korean or paid much attention to Korean history, apart from its art history. After World War II, the British returned to Korea in 1946, reopening a consulate-general in Seoul. Missionaries and traders followed, but US influence in South Korea was even stronger than before. North Korea was effectively off limits; no Britons went there until the Korean War. Britain’s involvement in the war had much more to do with the US wish for international support and pressure than with any actual British interest in Korea. British views of Syngman Rhee were unenthusiastic, but its support—at least in public—for the United States and the South Korea did not waver. The war and immediate postwar developments ended any likelihood of British involvement with North Korea. Britain engaged with the South to a limited extent, but the North was unknown and seen as unknowable. Except at times of crisis, such as the ROK military coups in 1961 and 1979, the British media devoted little attention to any part of Korea. Occasional Korean-language advertisements planted by North Korea in British newspapers made no sense to a British audience and merely underscored the oddity of the peninsula. North Korea generally attracted little attention. When it did get coverage, it was seen as strange and unfathomable. Events such as the 1983 bomb attack on South Korean President Chun Doo-hwan in Yangon (Rangoon) indicated that the North Korea was dangerous, but such developments took place far from Britain. By then, a few Britons were traveling to the North, but they were often from tiny left-wing groups and made little or no impact on the mainstream media or the wider public. Pyongyang’s links with the Irish Republican Army might have been seen as more serious, but few knew about them at the time. As the DPRK opened cautiously to tourism in the 1980s, British journalists who previously were not usually allowed in the country began to go as tourists. Among the first was the then-head of the BBC’s World Service China section, who found the country in the mid-1980s to be wealthier than China. An unfortunate tradition then began to take hold. Journalists entered the country under a series of guises. During the famine years of the 1990s, such visits became more frequent but the quality of coverage did not improve. Some who should have known better wrote their stories before they went and were surprised that the North Koreans took offense. This created the situation that we now have. Because journalists enter the DPRK in a clandestine fashion, their reporting has inevitably become hole-in-corner. Typical of this group was the BBC’s John Sweeney, who passed himself off as a university professor and whose predictable and banal reportage was only matched by a tendentious book. Few have any deep understanding of the country; as far as I know, only one British journalist has a Korean-language qualification. They overegg accounts of what is routine as something special, out of the ordinary—in a word, bizarre. Some do seek expert advice but are often disappointed when the advice does not confirm their preformed picture. Photographs of even the most routine nature are billed as “secret insights into the Hermit Kingdom.” When I was in Pyongyang (2001–02) one reporter published an account of an arms deal based on seeing some North Koreans and what looked like Middle Eastern visitors dining in the Koryo Hotel. They were apparently talking in Arabic and Korean. That he knew neither language was no handicap. But he was very bitter when the North Koreans refused him a second visa. Such journalism is not confined to the British media, of course, but it does seem to have a strong hold among British journalists and I fear the pattern is too well established to change. Serious stories do sometimes appear. From 2000 to 2002, the BBC correspondent in Seoul, Caroline Gluck, made frequent visits to North Korea and reported on a wide range of issues. She could be critical, but she never reported what she had not seen personally. More recently, The Guardian’s Beijing correspondent, Tania Branigan, produced good reporting and comment on North Korea. But these examples are likely to remain the exception. They established a naval base at Komundo (Port Hamilton) in 1885 without Korean permission, but their occupation of the island group had more to do with Russia and Afghanistan than with Korea. After two years, the Royal Navy abandoned the site after deciding it did not make a suitable base after all. British missionary work was largely confined to a small group of Anglicans (Episcopalians) and the Salvation Army, which saw itself as an international organization. Korea generally did not attract much attention in Britain. Korean studies were limited to London and Sheffield universities, with the emphasis decidedly apolitical. The main exception was its participation in the 1966 World Cup held in the United Kingdom. Despite strenuous government efforts to prevent it, a North Korean team came to Britain and did well, defeating Italy. This led to a brief period of positive media coverage. North Korea’s attempted assassination of South Korean President Chun Doo-hwan failed but killed several ROK cabinet ministers and senior officials in the process.